Thanks for your interest in joining us for the sail from the US East Coast to Bermuda in June 2017 to be in Bermuda for the Americas Cup finals. As you can tell by our pricing the intention is not to make money but to help boats owners and crew make plans to be in Bermuda for the Americas Cup and enjoy the competition and ambiance of being in Bermuda for this big event. The more boats that sign up the more benefits we can garner from the sailing industry. Can you easily sign up online here. The plan is to depart from a few chosen departing locations, but also have some flexibility to allow boat owners to depart from their home ports without being overly restrictive. We will have a shared departure date with a weather router giving us a departing forecast. Our weather router is WRI who also do the weather for the NARC Rally and the ARC. The distance from the East Coast of the US to Bermuda is about the same whether you are departing from Maine or the Chesapeake, it is all about 650 to 750 miles and will take us all from 4 to 6 days to get there. Although June is the official start of the hurricane season, it is in fact the best month of the year to sail to or from Bermuda. Both the Newport Bermuda Race and Marion Bermuda Race are mid June. While the dockyard will be full of mega-yachts and Hamilton will be filled with local boats and the Marion Bermuda Race participants, we will be taking over the St. Georges Dinghy and Sports Club and a designated anchorage area for the overflow after the club docks fill up. There will be very limited dock space at the club until June 15th since the Bermuda One/Two race will be in town until they depart for the return leg on the 15th. What is nice about our event is that even if we have to anchor out for the first couple of days or the entire time in Bermuda, we will have a launch service to get you to and from shore so you do not need to bring a dinghy with you on the offshore passage to and from the island. To join the rally simply fill out the short form and pay the $199 boat fee and the per person fee. You can download the form and pay by check or with a credit card on our web store. 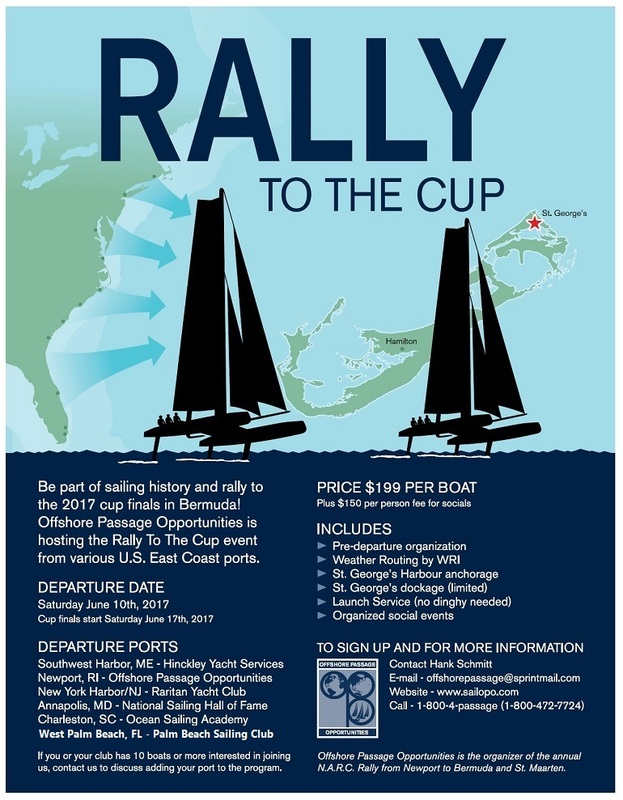 After you join we will be mailing you a Rally to the Cup T-Shirt so you can start bragging to your friends that you will be sailing to the Americas Cup finals in June 2017. Every crew member will get a free Rally to the Cup T-Shirt and you can order additional T-shirts for $25 each. Before departure you will also be sent a Rally to the Cup Burgee to fly on your spreader flag halyard. We will send you more information as we get closer to the departure date. With the low entry fee we expect to have a good fleet sailing to Bermuda and gathering in St. Georges Harbor. If you think you will need extra crew to sail to or from Bermuda or if you need a skipper to deliver the boat either way please let us know as we are the #1 Crew Network in North America and can help get you experienced crew that will volunteer to sail for free and even pay their own way to and from the boat. OPO has organized the NARC Rally from Newport to the Caribbean with a stop in Bermuda every year since 2000. Besides the weather router, socials and swag for each participant we will guide you through the planning stages and on island logistics to make your planned visit to Bermuda for the Americas Cup a very rewarding experience. You take care of getting your boat ready and we will take care of the rally logistics and best venues to see the Cup when you arrive. While we are not an official rally to the Cup and have no affiliation with the ACEA, there will be plenty of information about getting to the Cup Village to watch the event from ashore or we can tell you how to plan to be on the race course each day of the finals if you wish. There will be a couple of socials included in the rally and we will keep you posted about what is going on and what other socials and festivities will be going on during the America’s Cup finals. Copyright © 2019 Offshore Passage Opportunities. All rights reserved.